A calendar with layers to help you manage all aspects of your life. 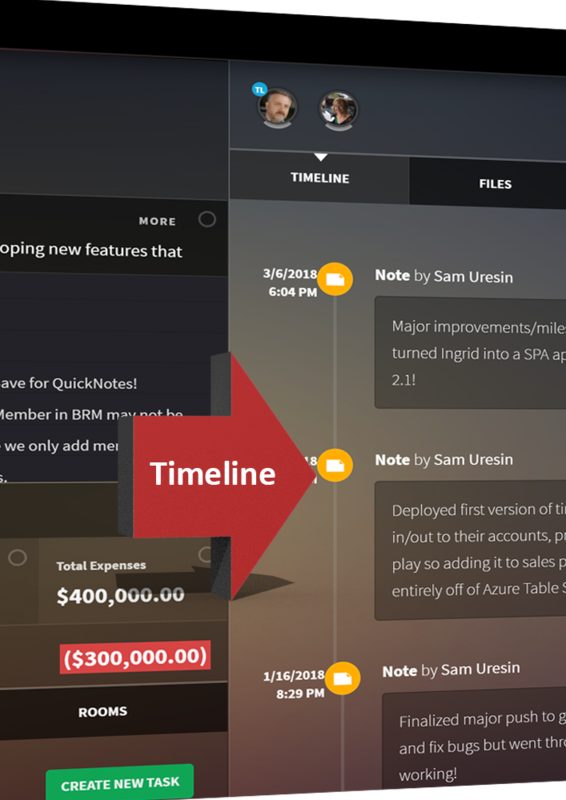 Time tracker, project budget, file sharing, project history and more. Time tracker, task budget, file sharing, task history and more. Organize & share contacts. Totally unique "Live Contacts" feature! Don't just share internally. Share with clients, partners, vendors, etc. Best features of email and text messaging combined into one! 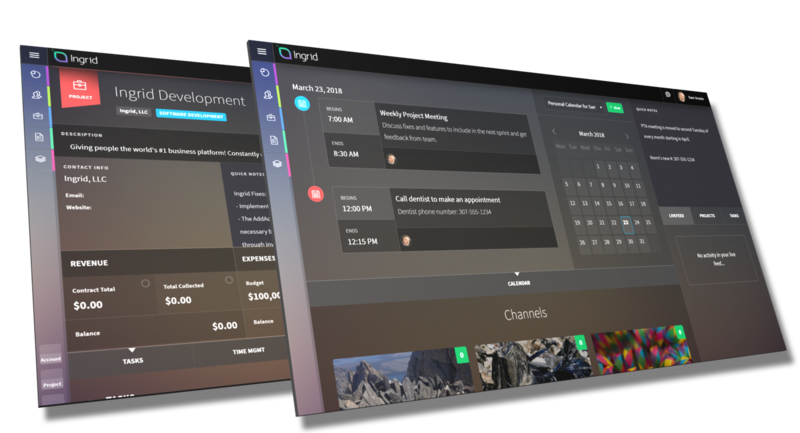 Profiles in Ingrid bring all aspects of your projects and tasks into one place. Invite your team members and start collaborating on your tasks and projects. You'll find everything in one place: files, contacts, budget information, project or task history and more! Don't stop there. The Rooms feature allows you to share files, messages and more with clients, partners and vendors. Ingrid Messaging combines the best features of email and text messaging. Ingrid Messaging brings messages into your contacts, tasks and projects. Communicate both internally with your team members and externally with your customers, clients, business partners and even vendors. Context sensitive messaging brings the message directly into your contacts, tasks and projects. 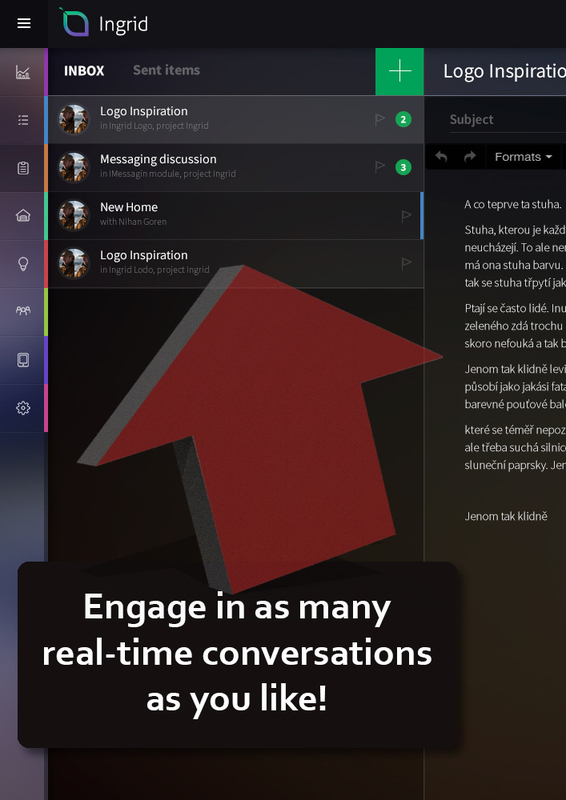 No need to look for a message in your email inbox, text or chat app anymore. Acts like email and text messaging. It's real time but stays in your inbox too. Ingrid Messaging also allows you to have multiple conversations with the same person so that you don't end up with a hodge podge of topics in one conversation. Take advantage of special pricing during our beta phase. Don't forget, your personal account is always FREE! Can I try Ingrid before I pay for a subscription? When you sign up, you get a personal account which is and will always be FREE! During registration, we don't even ask for a credit card. You only pay for an Ingrid subscription when you decide to create a small team, small business & startup or big business account. Just click here or one of the "Join Now" buttons which will take you to our login page. If you haven't signed up yet, simply click the Sign Up link at the bottom of the login page. Of course! You simply create an account for each company or startup so that you can manage them separately. There is no limit to the number of accounts you can have. You can also have different subscription levels for each account. For example, you may choose small team for one account and big business for another. Yes, we are hard at work developing Ingrid Mobile for iOS and Android platforms and plan on releasing it soon. We simply wanted to get the desktop version of Ingrid out and put it in the hands of our users during the beta phase so that we can not only solidify the Ingrid platform in terms of stability and features but also allow the feedback we receive from our users to guide us in our design and development process. What's with the mountain theme? Ingrid was designed and created in Jackson Hole, Wyoming, the land of the Grand Teton and Yellowstone National Parks. We are so inspired by this enchanting place we call home that we wanted our design to reflect this beauty. We wanted our users to almost feel that crisp mountain air coming from the Rockies! Get your FREE personal account today!